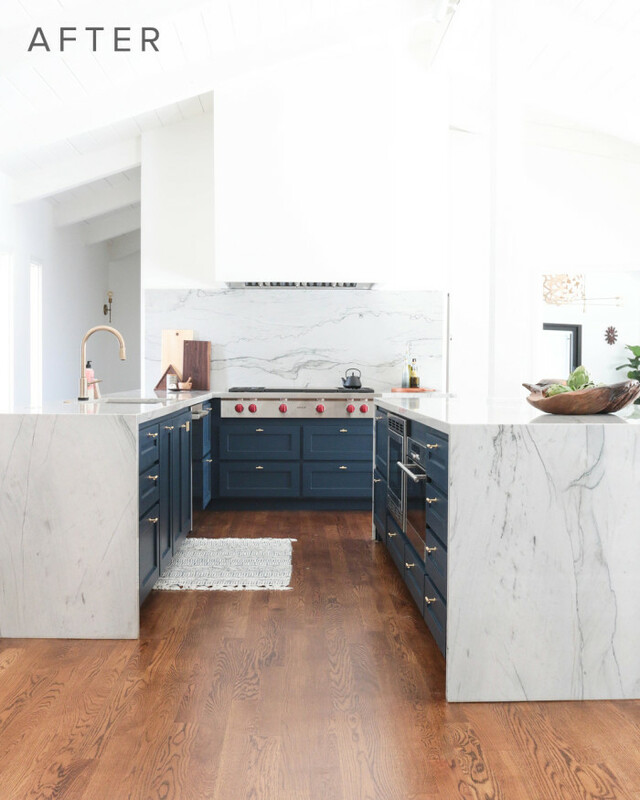 Dark bottom cabinets paired with Carrara marble and butcher block countertops look outdated with older appliances. The room seems dark with the yellow walls. Waterfall countertops in stunning quartzite turn this kitchen around. From drab to dramatic, polished Infinity quartzite countertops transform this kitchen and take it to a much higher level of style. 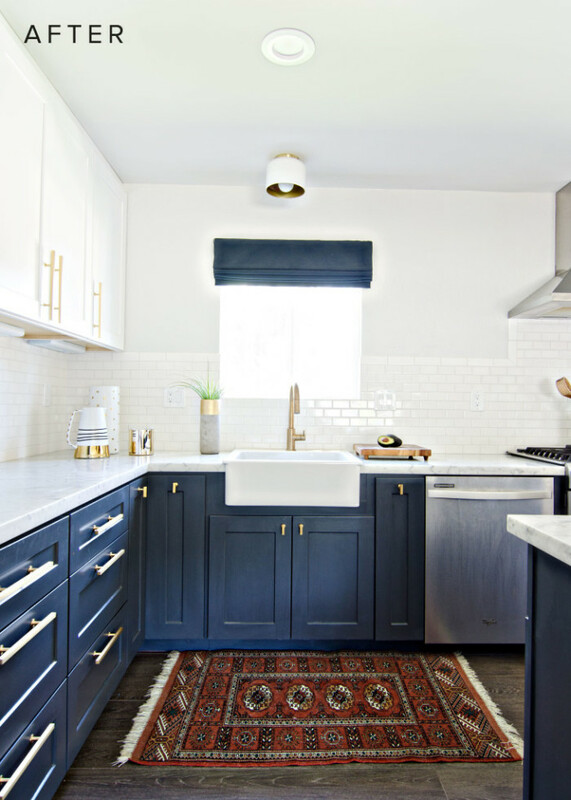 This space is now light and bright, with the blue cabinets grounding the look. 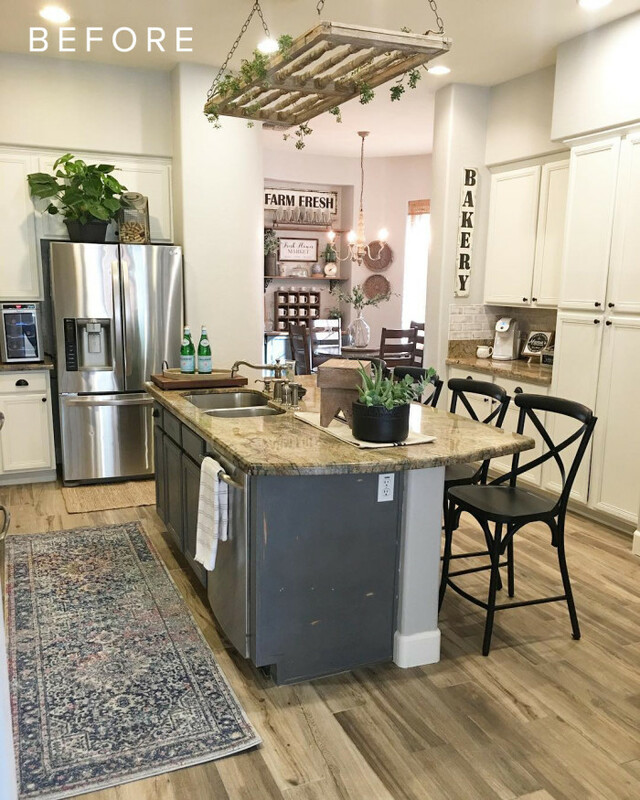 The designer chose to design the counter with a waterfall edge, which extends the quartzite down the side of an island and cabinets, all the way to the floor, making it the star of the room. When this same material is chosen for the stove backsplash, the whole space has unity. 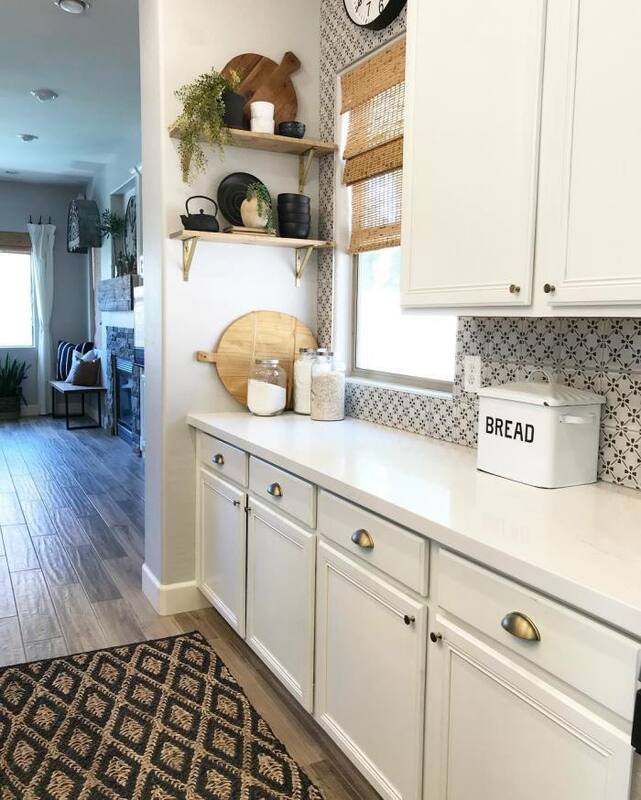 This kitchen is well designed and just needed a few changes to give it new life. This homeowner was done with the warm gold granite for their island and surrounding counters. The colors felt outdated and didn't fit her vision of a cohesive design. 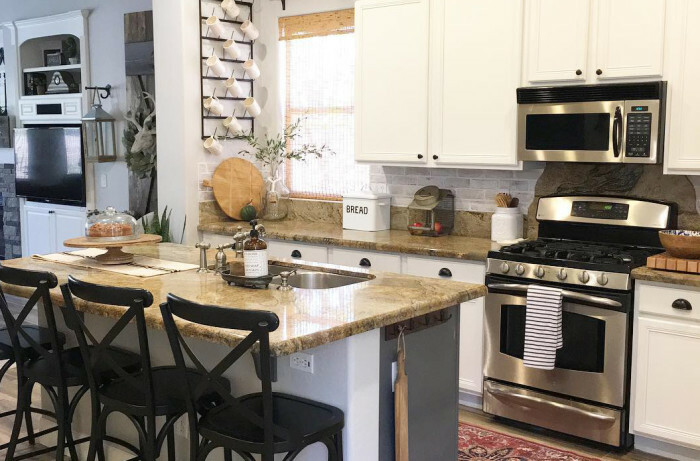 This home belongs to Jaclyn Hodge, who enjoys design, decorating her home and sharing her ideas on her Instagram @shabbydesertnest. Just add white! 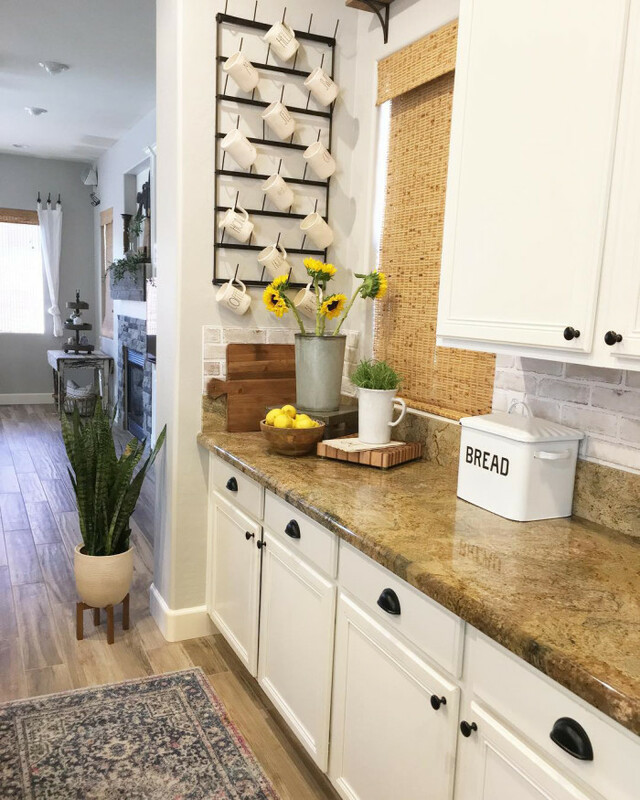 By changing out the dated granite counters, painting the island and adding a super cute backsplash, this kitchen has improved its look tenfold. It didn't take a complete gutting and massive remodel to update their look. 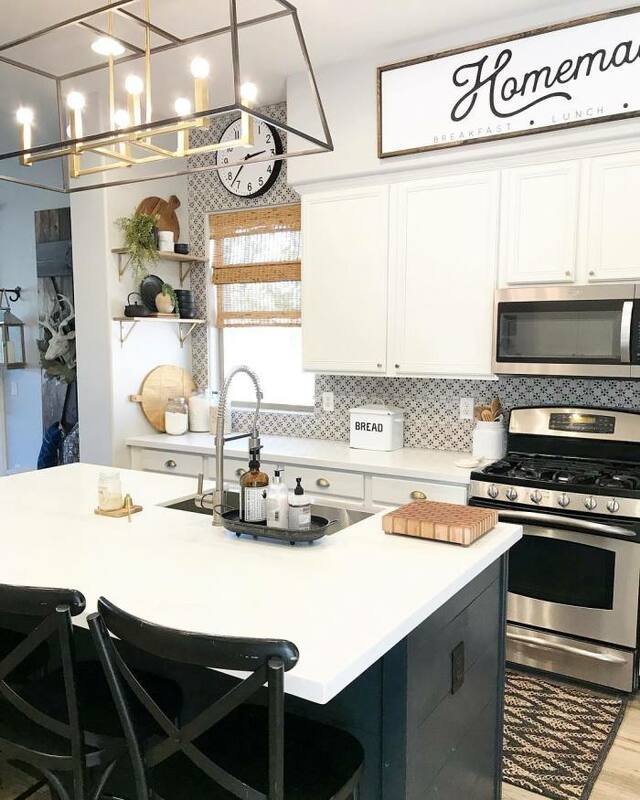 Simply by going with elegant black and white accents, this kitchen feels completely different. 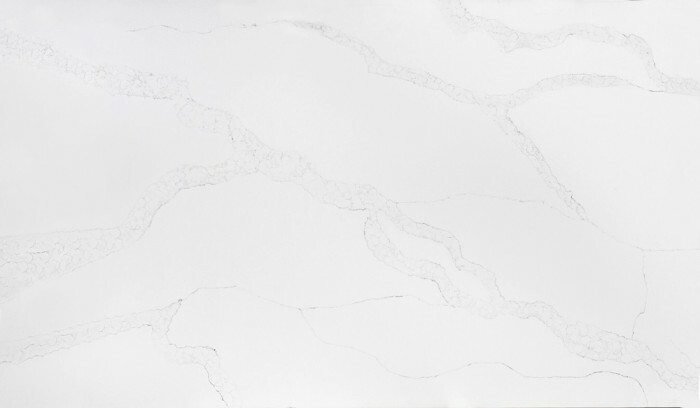 The homeowner chose our Sequel Quartz in a marble-look color called Calacatta Ravenna. 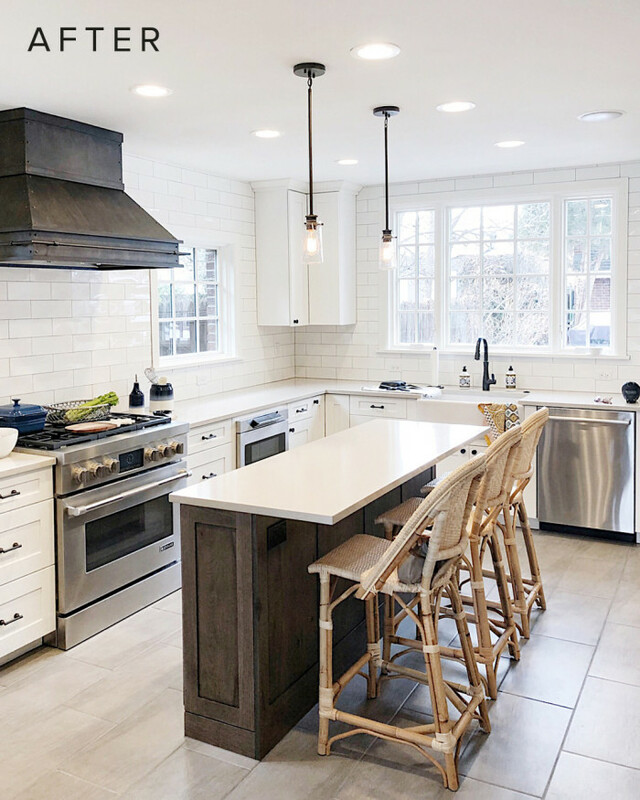 The white color with thin grey veins helps lighten up the whole kitchen and brings the black color accents through the kitchen and house stand out. Busy backsplash. 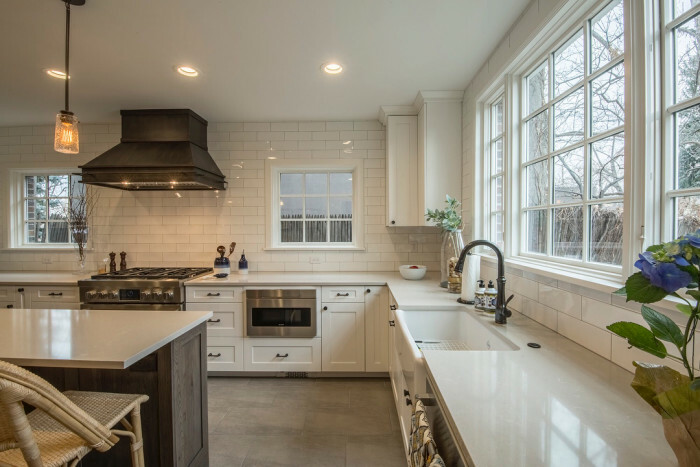 The previous backsplash was a combination of the granite from the counters and grey-painted brick tile and didn't blend well, causing it to look busy. The organic cut of the granite behind the stove felt too artsy and didn't match the vibe of this homeowner's style. Time for a completely new look. 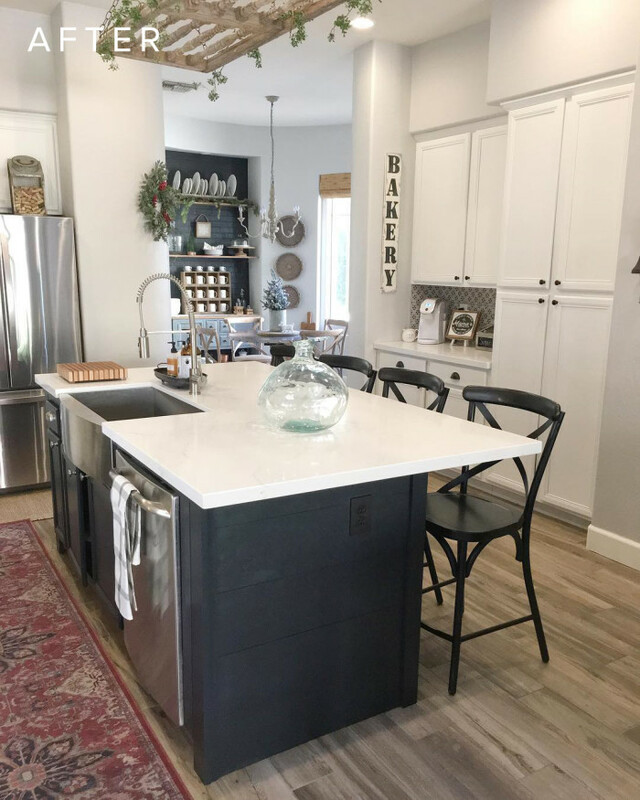 To turn the previous design on its head, the homeowner chose the 12"x24" Bloom Deco porcelain tile from our Palazzo Collection to bring tailored look to the space. This time, she chose to take the tile all the way up to the ceiling, which makes the room feel larger and more stylized. 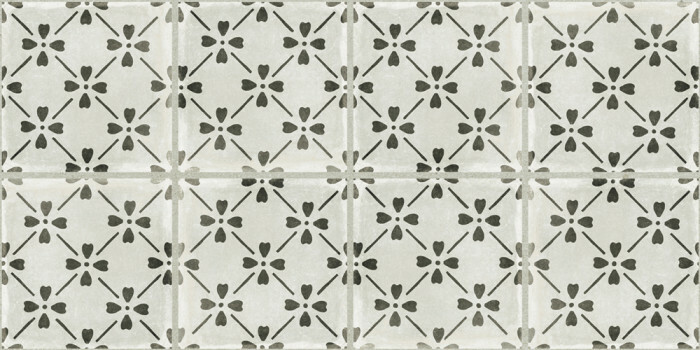 The design on this tile is divided into eight sections with faux grout lines separating the segments, giving it a more traditional look. 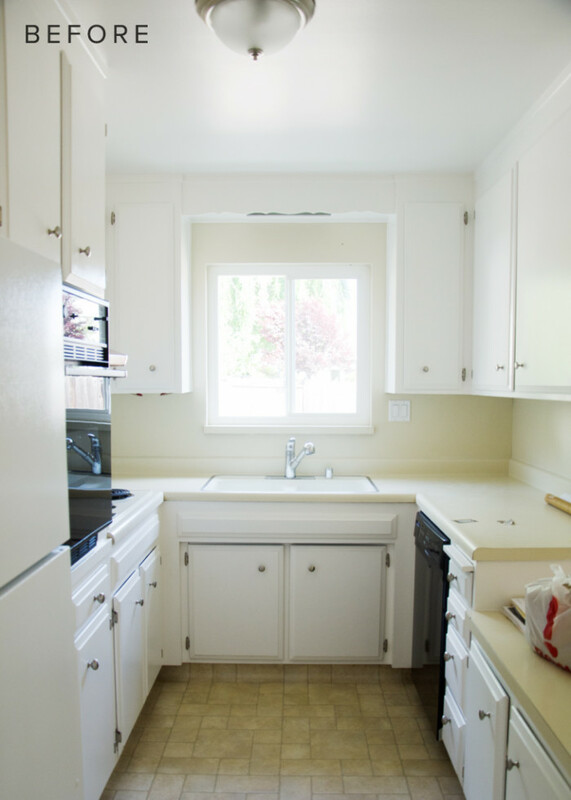 Dark and outdated, this kitchen needed light not only from the sun, but on its surfaces, too. The brown cabinets and black counters absorb all the light, making this room feel cold and small. 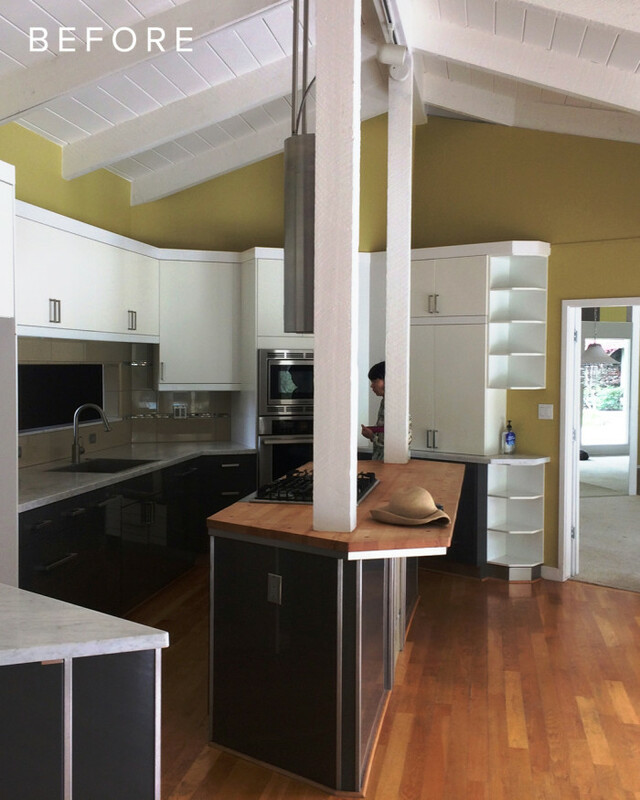 This kitchen was transformed by Kitchen and Floor Concepts. What an amazing transformation! Out with the dark and in with the light! 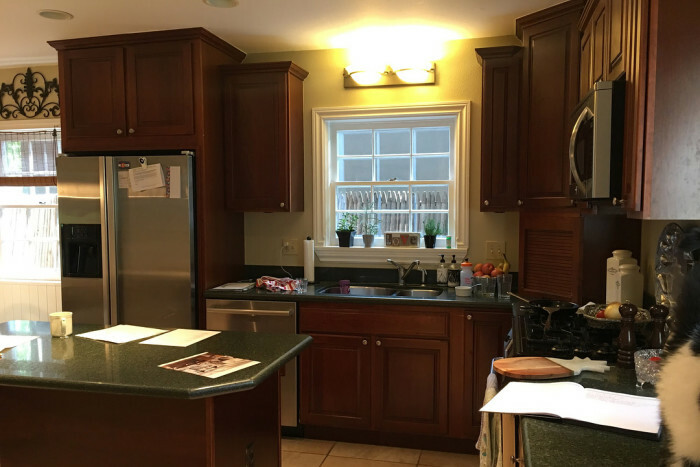 This kitchen is unrecognizable with its new window and white surfaces. The designer opened up the room by adding in a large window and replaced the heavy colors with bright choices. 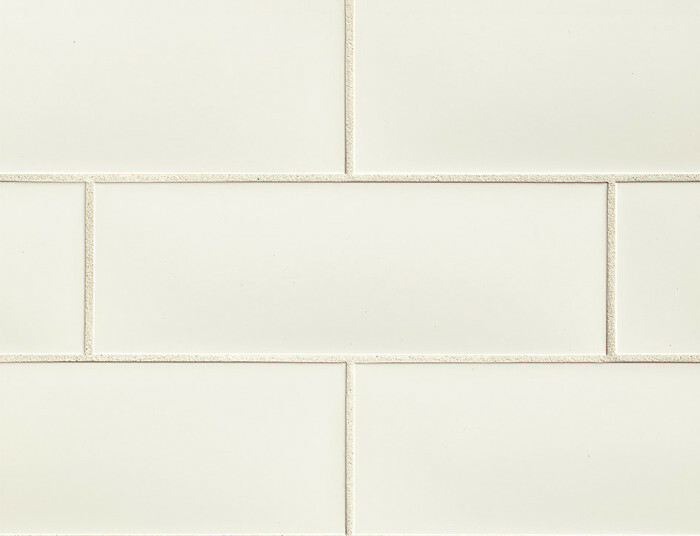 Our ceramic wall tile Grace in the Bianco color is used in the counter-to-ceiling backsplash. The glossy finish reflects light, brightening up this space even more. 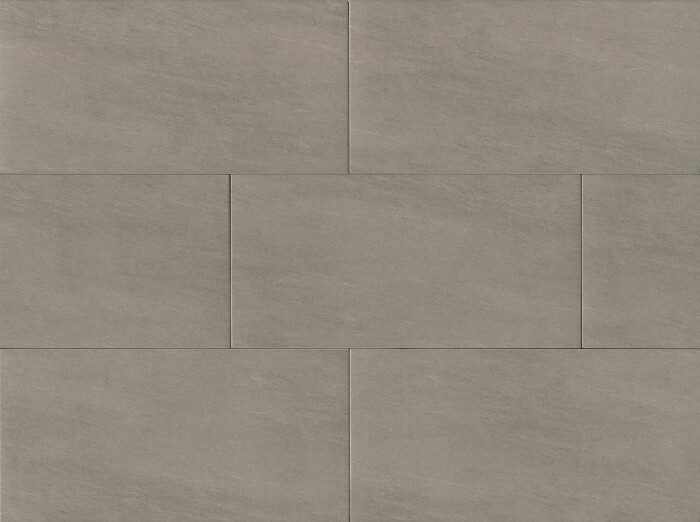 For the floor, the designer chose our Moonstone porcelain tile in Light Grey. This was a kitchen in need of a major overhaul. It hadn't been updated in years, as it still had laminate counters and a vinyl floor. A wall divided the kitchen from the rest of the living area, which closed it off and made both spaces feel small. 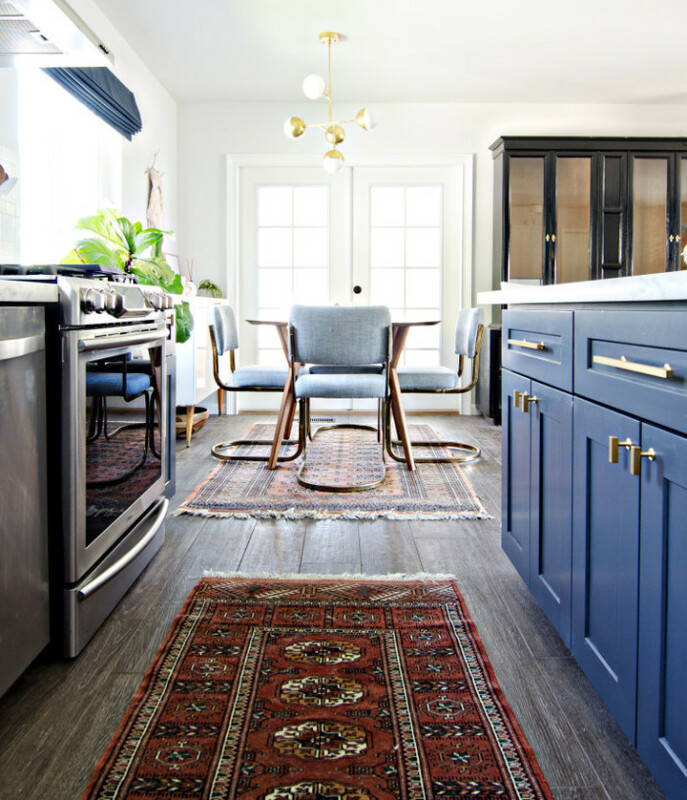 This kitchen belongs to and was designed by Brittany, who is a California based designer, curator, and blogger with an expertise in vintages rugs and textiles. Wood-look tile becomes the new foundation. 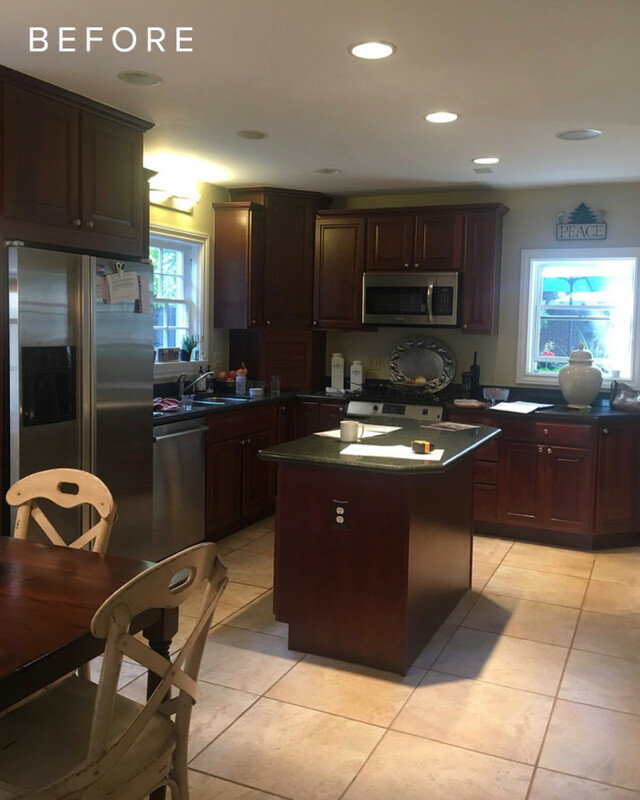 This homeowner has a busy, active family with a kid and dogs and wanted something durable that could withstand scratches and daily wear and tear, yet look attractive. 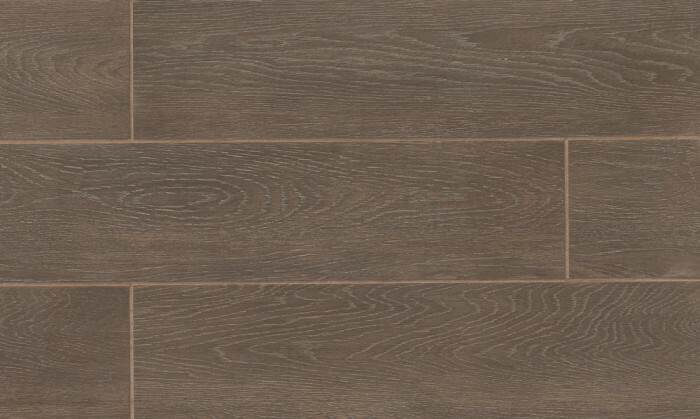 After careful consideration, she and her husband chose our Allways wood-look porcelain tile in the Pier color in the long 8"x48" plank size. "My husband and I were utterly in love with the Allways tile, it’s scale was perfect – super wide & long planks. There’s not a day that goes by that I don’t think about how much I love these floors." - Brittany, homeowner. 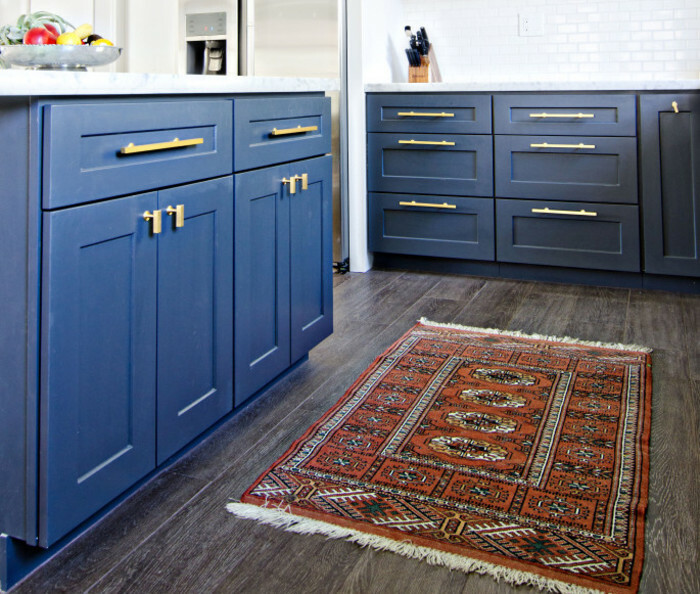 We hope our show and tell of kitchen makeovers inspires you to do something new and brave with your spaces! View our products and browse our inspiration gallery. 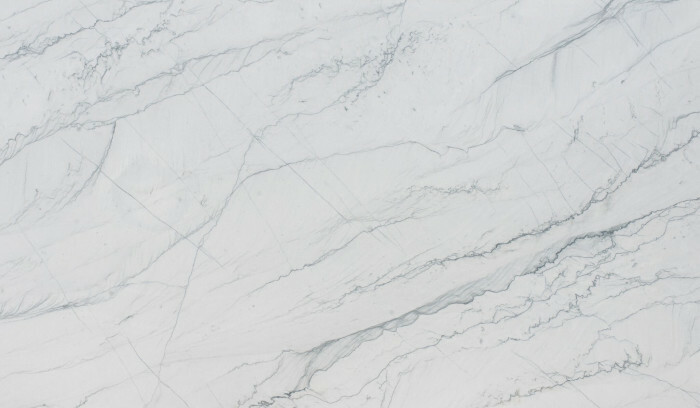 Also, we encourage you to visit our showrooms and slab galleries to see, touch and choose products for your next project.